I have some questions for you about your binding. Do you have a tool to translate an ebusd configuration file to a json file for your binding ? You asked help to support more devices (on your README). Is there a path to shared configuration files ? Last but not least : Could it be possible with your binding to spoof an eBus device ? I mean, I don’t have any VR90 installed but I want to simulate it. My heating configuration is not really optimal… I have 2 pumps (floor heating and radiators) but I only have a VRC700. So the configuration is that the VRC700 handle the temperature control of the floor heating and the first floor (radiators) are in permanent heating even if not needed (the room temperature is controlled with valves). So my goal is to use sensors in each room and to combine them to act as a VR90. I just migrated to openHAB 2.4.0~S1443-1 (Build #1443) and your newest binding eBUS binding 2.4.0-RC3. Everything went quite smoothly, various things got autodetected on eBus. I even was able to link values to my KNX installation. 2018-11-25 18:18:48.349 [ERROR] [bus.service.parser.EBusParserService] - Error while firing onTelegramResolved events! In your case one of the received values is NULL and causes an exception, I’ll fix it next days. So, the new bugfix version should fix your null point exception. 2018-12-03 23:10:01.884 [WARN ] [hab.binding.ebus.handler.EBusHandler] - Unexpected datatype NULL for channel ebus:std_controller_op-data-rc2bc_value-fuel ! 2018-12-03 23:10:01.889 [WARN ] [hab.binding.ebus.handler.EBusHandler] - Unexpected datatype NULL for channel ebus:std_controller_op-data-rc2bc_modulation ! 2018-12-03 23:10:01.894 [WARN ] [hab.binding.ebus.handler.EBusHandler] - Unexpected datatype NULL for channel ebus:std_controller_op-data-rc2bc_pressure-d-boiler ! Oh, not really better. Null is also a valid value, I will change this next time. I had a test run with binding and it works fine both on my RPI. What I wanted to ask is support for textual configuration of things - is it possible to define & version configuration as it was possible with 1.x version of binding? As small tip - since several months - it is possible to automate discovery of serial devices with mechanism introduced in ESH. Thanks to that known devices such USB adapters can be automatically added to inbox without asking user to find proper /dev/ttyUSBx. Below I attach small screenshot with statistics of my Vaillant ecoTec/calormatic 430. From most annoying parts - I can not read part load which is one of most interesting fields to have. Thanks @csowada for this binding. This is also my first post, as I am quite new to openHAB. I have just recently bought the latest version of the FHEM forum eBus boardv2.2 and have had success with ebusd /ebusctl to retrieve values from both my ecoTEC boiler and VRC700, however not so much with the binding for openhab. The first problem I had is related to my VRC700f, which was recognised as 15.b7v00 rather than 15.700 by ebusd, thus I had to manually download the CSV files, which might mean it does not get automatically recognised with the openhab binding either and how would one go about including the file here? It might just be me (openHAB noob), but it seems there is a lot of talk about these files in this thread, but not the location mentioned these have to be dropped, just in case this could be resolved with a simple copy/rename solution in my case. The second issue seems to be getting no readings from any items (just NULL). I have used the textual configuration for things and items, as the PaperUI did not seem to pick up anything in the beginning as well as that I wanted to be able to version control my configuration. I have used the serial connection in the end, as the network one did not work on the localhost and the binding tried several times to connect to no avail. Thirdly, is the network option for ebusd not supported and only for commercial products? address 08: slave #11, scanned "MF=Vaillant;ID=BAI00;SW=0603;HW=9102", loaded "vaillant/bai.308523.inc", "vaillant/08.bai.csv"
address 15: slave #2, scanned "MF=Vaillant;ID=B7V00;SW=0422;HW=5503", loaded "vaillant/15.b7v00.csv"
2018-12-17 14:38:08.427 [WARN ] [hab.binding.ebus.handler.EBusHandler] - Unexpected datatype NULL for channel ebus:bai_boiler_control_getopdata_temp-outside ! 2018-12-17 14:38:08.696 [WARN ] [hab.binding.ebus.handler.EBusHandler] - Unexpected datatype NULL for channel ebus:bai_boiler_control_setopdata_temp-d-srv-water ! I cannot get any information about my second heating circuit (HC2) - there is no such setting in current plugin. How can I set/find it? 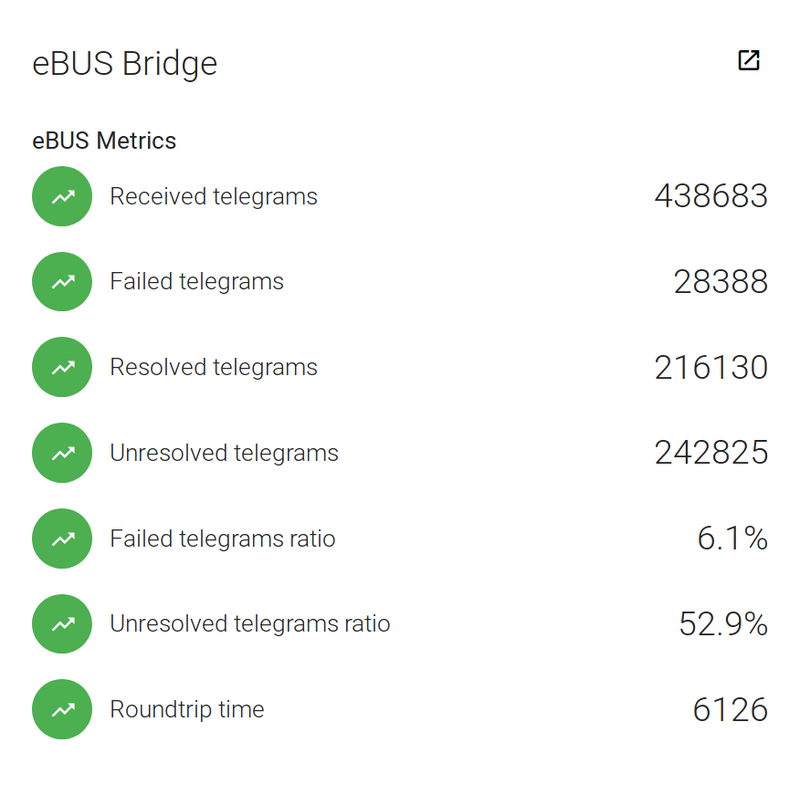 Update: I’ve checked logs from last month and all 6 eBUS standard devices where there. But some of them very rare. I’m a bit busy at the moment, but I think I’ll find some free time after Christmas to answer your questions. Thing UID                                | Label                                    | Refreshed ? what could I do that my devices are recognized? you can add a device manually, so if the automatic discovery is not working you should got that way. The binding has only a limit set of Vaillant devices on board. the binding adds an eBUS standard thing for every known eBUS device, that is normal. Many devices uses eBUS standard and Vendor specific commands. Have you seen any error while sending commands? Maybe it is a timing issue. You could try the new serial drive if you use a serial connection. I try to help, but I need more details to help. So please provide raw command examples if possible, than I’m able to reproduce the conversation from openHAB to eBUS raw telegrams. And if your setup is running properly with ebusd please provide some example output. 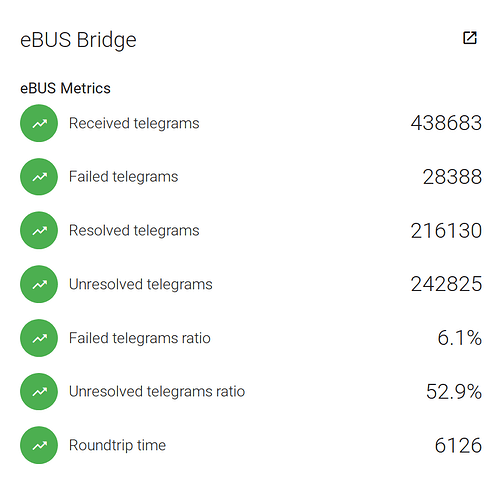 Another information is how the eBUS interface is connected to the binding (ethernet/serial)? But every one should know that the binding only contains a subset of the ebusd configurations. What I wanted to ask is support for textual configuration of things - is it possible to define & version configuration as it was possible with 1.x version of binding? Yes, it possible. You can find the description in the README.MD of the binding source. directory. The zip file contains the individual bundles of the binding. As small tip - since several months - it is possible to automate discovery of serial devices with mechanism introduced in ESH. Thanks to that known devices such USB adapters can be automatically added to inbox without asking user to find proper /dev/ttyUSBx . Really interesting change. I will have a look on it next days. I guess that you also run an ebusd setup, so can you provide a valid “set” command from ebusd include the values to set? With this I can compare the result of the current configuration. Converted ebusd configuration for ebus library. Contribute to csowada/ebus-ebusd-configuration development by creating an account on GitHub. I have an official github repositiory for the included configurations. Help is always welcome, you can always create a pull request. Last but not least : Could it be possible with your binding to spoof an eBus device ? I would say that this will not really work. The binding is not able to act as slave device. So you can’t handle master-slave telegrams. If you only set values it could work. @lukics and @csowada i have two similar units but they are called Brink Renovent 300 and are used in a master/slave setup. I added the ebus 2.0 binding and the bridge is online (I use a Esera USB coupler) it also discovered two things. Named eBUS Standard (3C) and eBUS Standard (56). [WARN ] [hab.binding.ebus.handler.EBusHandler] - Unexpected datatype NULL for channel ebus:std_common_identification_software-version ! Any suggestions how I would get this to work with the Brink Renovent 300? @witek_1308 I send You PM 10day ago, but I didn’t find anything more about HC2. Could You please send those to me? @csowada Thank You for an answer. When I set “log:set TRACE org.openhab.binding.ebus” then in logs there is “Received telegram from address FF to 15 with command dhw.program_dhw_circuit” but no raw command. What do You mean by “new serial drive”? I have Esera usb coupler and majority of commands works as expected. Could you please check if this is a misstype ? You fill find 2 times “boilder”. Did you mean “boiler” ?